This book provides a comprehensive state-of-the-art review of personality and intelligence, as well as covering other variables underlying academic and occupational performance. Personality and Intellectual Competence is a unique attempt to develop a comprehensive model to understand individual difference by relating major personality dimensions to cognitive ability measures, academic and job performance, and self-assessed abilities, as well as other traditional constructs such as leadership and creativity. It will be essential reading for anyone interested in personality, intelligence, and the prediction of future achievement in general. Personality and Intellectual Competence is an outstanding account of the relationship between major individual differences constructs. With its informative summary of the last century of research in the field, this book provides a robust and systematic theoretical background for understanding the psychological determinants of future achievement. The authors have sought to combine technical expertise with applied interests, making this a groundbreaking theoretical tool for anyone concerned with the scientific prediction of human performance. Contents: Preface. Overview: Predicting Future Achievement. Personality Traits. Intellectual Ability. The Personality-Intelligence Interface. Personality and Intelligence as Predictors of Academic and Work Performance. Self-Concepts and Subjectively Assessed Intelligence (SAI). Individual Differences and Real-Life Outcomes. Overall Summary and Conclusions. "...provide a superb, well-written book on relationship between personality factors and measures of intelligence, academic competence, work performance, and self-assessed intelligence. This book is unique in that it is written in a style accessible to those unfamiliar with issues in personality and intelligence and at the same time it contains material that will be valuable to those with experience in the field. Essential." "The authors have a significant corpus of published research offering suggestions aimed at clarifying the personality-intelligence befuddlement that is currently mucking up the emotional intelligence field....this is an excellent and very informative read." "This volume provides a superb integration of the multiform research literatures on personality and intelligence. Chamorro-Premuzic and Furnham survey a wide panorama of studies in these two principal domains of differential psychology. They arrive at a theoretical synthesis that successfully blends the best of current knowledge with new insights to illuminate the subtle interplay between intellectual competence and personality traits such as extraversion, neuroticism and openness. 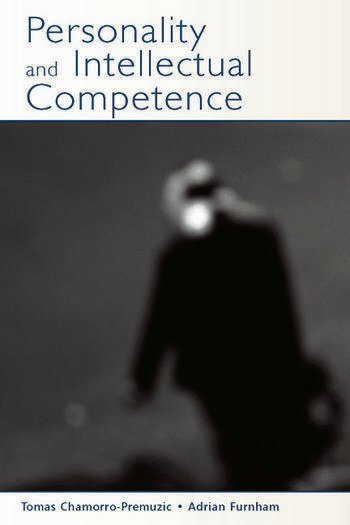 Chamorro-Premuzic and Furnham explore some neglected but important bridges between ability and personality, including self-awareness of competence and dynamic interaction between personality traits and competence...They also provide fresh perspectives on motivation, creativity and scholastic achievement. The lucidity and accessibility of the writing--together with the authors' attention to the significance of personality and intelligence in real-life--will ensure that this book finds a wide readership among psychologists, educators, and organizational psychologists." "This book provides an excellent compilation of research across traditionally disparate domains of inquiry. It will be especially valuable to personality researchers interested in intellectual competence, and intelligence researchers interested in personality traits. The authors provide convincing demonstrations that integration across these domains will result in better understanding of similarities among, and differences between people."